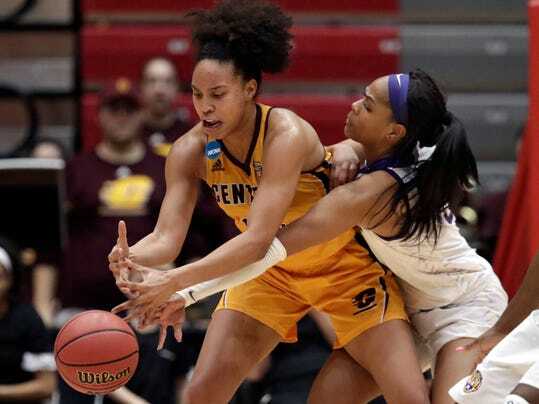 COLUMBUS, Ohio (AP) — Tinara Moore scored 25 points to help 11th-seed Central Michigan get its first women’s NCAA Tournament win with a 78-69 victory over No. 6 LSU on Saturday in the opening round. The Chippewas, who had lost in their first three trips to the NCAAs, got in the tournament for the first time in five years by upsetting Buffalo in the Mid-American Conference Tournament. Moore and Central Michigan dominated inside, outrebounding the Southeastern Conference team 40-27 and creating more second chances. Reyna Frost 12 points and 12 boards for the Chippewas before fouling out late in the game. Central Michigan led by as many as 11 in the second half. A 6-0 LSU run reduced the lead to five, but the Tigers couldn’t get any closer, despite limiting their opponents to only foul shots in the last 2:43.